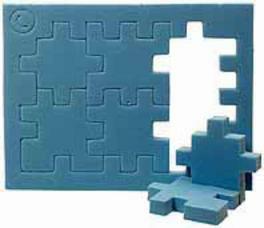 2D and 3D puzzle. This puzzle is not that hard but still offers a challenge. With the game comes a frame and your first challenge is to get pieces out of the frame. Next challenge is to put the pieces back to the frame. Build a cube of the pieces. Size of the 2D version is 9 x 12 cm. For children 5+.